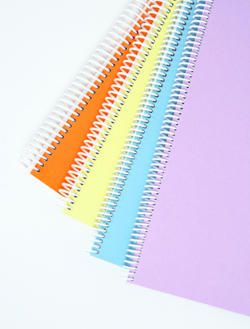 Coil binding, also known as spiral binding, is a durable book binding style commonly used for creating multiple page documents like syllabi, reports, lab manuals, workbooks, presentations and proposals. Documents open flat on a desk or table, can fold back on itself and offers 360 degree rotation for easy reading and note taking. We offer coil binding solutions in a wide range of sizes and can help you find the perfect fit for your document. Contact us today!